Monday was a life changing day for Moses Zadock Okumu Ombura. Moses is 36 and lives in a small apartment with 9 other family members in the Umoja area of Nairobi. Due to a birth defect Moses must depend on his younger brother Garrison to carry him wherever he goes. Garrison serves his brother selflessly. Monday we took Moses and Garrison to The Association for the Physically Disabled of Kenya to pick out a wheelchair for him. On Wednesday we will deliver it to his home. We were able to borrow the chair in the photo for our time at the center. We were so touched when we realized this family has waited so many years for a wheelchair. God chose to use Burning Plow Ministries (and our partners) to answer this family’s prayers. It is humbling to be the conduit between God and his children who need His provision. A special thanks to those who give to Burning Plow Ministries. Without their support we could not do what we do to bless the people of Kenya. It is only one man, one family, but they are thanking God for His blessings. We appreciate those who give to bless those who will never be able to repay. 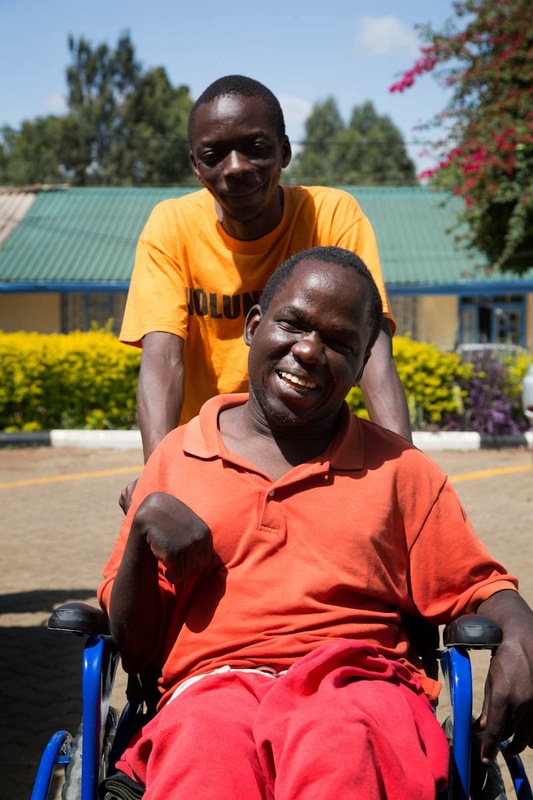 After we deliver Moses’ chair on Wednesday we are heading to the village of Kibwezi where we will deliver three hand cranked bikes for three disabled men in that area. I’ll be posting details of that trip next week.